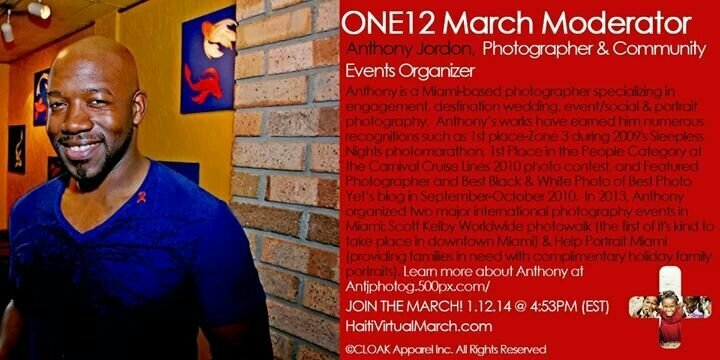 We are very happy that our friend, Anthony J was selected to be one of the moderators of the 4th Annual ONE12 Haiti Solidarity Virtual March with CLOAK INC. In its fourth year, the purpose of the Virtual March is to promote love and support for Haiti on Twitter (follow and retweet @CLOAKINC). Over the past three years the online march has gained momentum and has found a unique way of celebrating the resilience of those who lived through and commemorate those who lost their lives in the devastating earthquake of 2010. In May of 2013, CLOAK INC announced their newest social initiative – joining the fight against human trafficking. This year’s march will focus on raising awareness and speaking up concerning trafficking of Haiti’s most vulnerable, its children. Join the march on January 12th, 2013 at 4:53pm (EST) and tweet your love, hope and help in safe-guarding Haiti’s children through education and care. Follow him on twitter @antjphotog AND @CLOAKInc and be sure your tweet counts by using hashtags #ilovehaiti and #cloakthekids when tweeting.